30 Dec 2013 Put up a setlist page for the 31 Oct 2013 Grant Hart solo gig at The Miller in London. Thanks to Chantal Latchford. 29 Dec 2013 Added a previously unlisted Bob Mould date, based on a recording that just turned up on Dime: 04 Sep 1991, Daily's Bar, Stockholm. Also put up a setlist page and a skimpy venue information page for the club. Thanks to Sumant Ranji, Dominique Valentin, and Kieron Perry. 27 Dec 2013 Put up a venue image page for Larimer Lounge in Denver. 25 Dec 2013 Put up a venue image page for Crystal Pistol in Tulsa OK. Thanks to Greg Sewell. 23 Dec 2013 Put up a venue image page for Syria Mosque in Pittsburgh and updated its venue description page. 23 Dec 2013 Put up a print ad image for the Hüsker Dü 30 Sep 1984 gig at the Channel in Boston. 22 Dec 2013 Put up a print ad image for the Hüsker Dü 10 Aug 1982 gig at the Crystal Pistol in Tulsa OK. Also added a print ad image for the 21 Dec 1982 gig at the same venue. 21 Dec 2013 New Bob Mould solo date announced: 17 Jan 2014, Prairie Center for the Arts, Schaumburg IL. More info here. 20 Dec 2013 Put up a venue description page and a venue image page for Billie Goat Hill in St Louis, where Hüsker Dü played 31 years ago today. 19 Dec 2013 Put up a second flyer image for Grant Hart's 13 Dec 2013 gig at Stadthalle in Köln. Thanks to Martin van Rappard. Also put up a venue image page for Stadthalle. Thanks to Carsten Wohlfeld for the Köln photos. 14 Dec 2013 Upgraded the artwork page for the Robert Forster I Had A New York Girlfriend CD ("2541" cover). 13 Dec 2013 Put up a setlist page for the 13 Dec 2013 Grant Hart solo gig at Stadthalle Mülheim, Köln, Germany. Thanks to Carsten Wohlfeld. 13 Dec 2013 Put up a venue image page for Roseland in NYC, an old ballroom where Sugar played twice (and which is scheduled to close in April 2014). 12 Dec 2013 Added an entry to the Commercial Releases section of the annotated discography for the Bob Mould Workbook 25 2xCD/2xLP (25th Anniversary reissue, scheduled for release 25 Feb 2014). Also updated the summary discography. 12 Dec 2013 Put up a venue image page for 2922 Lyndale Ave S in Minneapolis, where Hüsker Dü participated in a house show to benefit Minneapolis Children's Hospital on 11 Dec 1982. 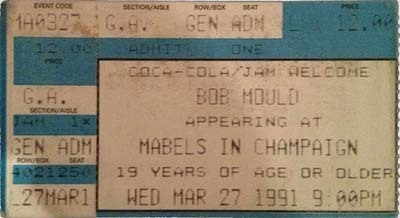 11 Dec 2013 Added a new ticket image (Bob Mould, 27 Mar 1991, Mabel's, Champaign IL; found on this page) to the ticket collage page and added this previously unlisted gig to the dates page. Also put up a venue image page for Mabel's. 08 Dec 2013 Put up a performance stills page for the 22 Nov 2013 Grant Hart gig at Cake Shop, NYC. Thanks to Ray Nichols/Lead Graffiti. 06 Dec 2013 Added "You Win Again" to the Songs Covered page. Thanks to Laki Vazakas. 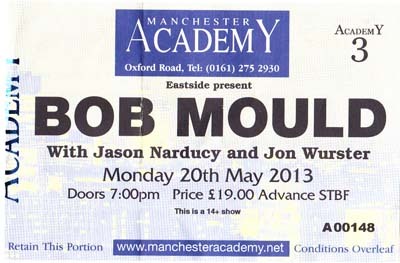 05 Dec 2013 New Bob Mould date announced: 17 Dec 2013, Second City e.t.c. Theatre, Chicago. More info in this article. Thanks to Roberto Gori for the Paridiso ticket image. The 02 Nov 1984 Entry gig and the canceled 25 May 1984 Arena (Rotterdam) gig were previously unlisted and added to the dates page. Also put up venue description and venue image pages for Arena, and updated the affected flyer image index pages. 01 Dec 2013 Put up a setlist page for the 01 Dec 1984 Hüsker Dü show at Lawrence Opera House, Lawrence KS. Thanks to Jason Willis. 30 Nov 2013 Updated the venue description page for the Bellevue Club in Brussels and put up a venue image page for the place (which appears no longer to be in operation, at least under that name). Grant Hart played there on this date in 1995. 28 Nov 2013 Put up a setlist page for the 22 Nov 2013 Grant Hart solo gig at Cake Shop in NYC. Thanks to John Hogan. 27 Nov 2013 Venue and date for Bob Mould's Noise Pop 2014 gig have been determined: 27 Feb 2014 at Bottom of the Hill, San Francisco. 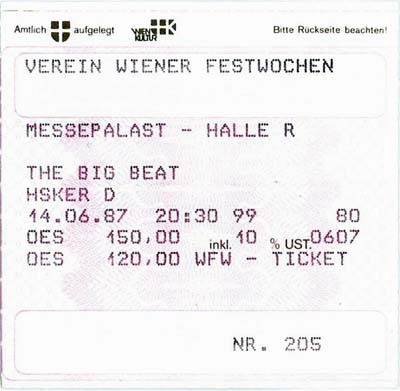 27 Nov 2013 Put up a poster image for the 18 Sep 1985 Hüsker Dü show at Remise (Bregenz, Austria). Added thids previously unkknown and unlisted show to the dates page, and added the flyer to the 1985 poster index page. Also put up a venue info page for Remise. Thanks to Scott Turner, Heinz Goedl, and Stefan Kullik. 23 Nov 2013 Put up a performance stills page for the 13 Nov 2013 Grant Hart gig at Sound Unseen (Amsterdam Bar & Grill, St Paul MN). 23 Nov 2013 Put up a performance stills page for the 15 Sep 2013 Bob Mould Band gig at Riot Fest (Humboldt Park), Chicago. 19 Nov 2013 Put up a performance stills page for the 29 Oct 2013 Grant Hart gig at The Hope, Brighton UK. Thanks to Simon Read for the photos. 19 Nov 2013 Put up a poster image for the 02 Nov 2013 Grant Hart show at The Railway, Winchester UK. Thanks to Andy Nazer. 14 Nov 2013 Updated the venue description page for Pillar & Post (Minneapolis) and put up a venue image page showing the new building that now occupies the club's former site. 14 Nov 2013 Put up a venue image page for The Catalyst (Santa Cruz CA). 10 Nov 2013 Put up a poster image for the 24 Jul 1981 Hüsker Dü gig at Mabuhay Gardens, San Francisco. 09 Nov 2013 Put up a setlist page and a poster image page for the 29 Oct 2013 Grant Hart solo gig at The Hope, Brighton UK (note that the poster is misdated as the 25th). Thanks to Martin van Rappard. Also added a venue image page for The Hope. 08 Nov 2013 Put up a performance stills page for the 03 Oct 2013 Bob Mould Band gig at Teatro Vorterix in Buenos Aires. Thanks to photographer Guille Coluccio for the use of the photos. 04 Nov 2013 Added a recently announced Grant Hart date: 13 Nov 2013, Amsterdam Bar & Hall, St Paul. Also put up a poster image for the gig. More info here. Thanks to James Lindbloom. 04 Nov 2013 Put up a venue description page to replace the dead link for Trax in Charlottesville VA, demolished more than 10 years ago. Also added a venue image page. Thanks to RJ van der Woud (Newport) and Murray Ramone (Edinburgh). 02 Nov 2013 Added a recently announced Grant Hart date: 22 Nov 2013, Cake Shop, Brooklyn. Updated the 2013 and 2014 poster index pages. 23 Oct 2013 Put up a venue image page for Mcdonough Field Stage, Emory University, Atlanta to replace the dead link on the dates page. 16 Oct 2013 Put up a setlist page for the 19 Apr 1994 Grant Hart solo gig at KNUST in Hamburg, based on a newly surfaced audio recording. Thanks to Stefan Kullik. 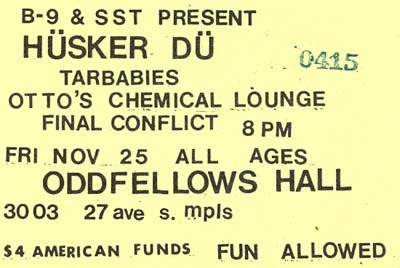 11 Oct 2013 Put up a performance stills page for the 12 Jul 1981 Hüsker Dü show at Showbox, Seattle, and added its link to the dates page. Thanks to Mike Leach of bestrockphotos.com. 11 Oct 2013 Added a recently announced Grant Hart gig to the dates page: 08 Nov 2013, Red Line Tap, Chicago. More info here. 23 Oct 2013, Broadcast, Glasgow (more info). 24 Oct 2013, The Trades Club, Hebden Bridge UK (more info). Thanks to Mike Melville and Marc Bright for the pointers. 24 Sep 2013 Added Greg Norton's 27 Sep 2013 Gang Font gig at Icehouse in Minneapolis to the dates page and put up a venue image page. More info on the gig here. Also put up a (one-song) setlist page for the afternoon gig (Greg sat in for one unknown song during the evening show), and added a poster image for the evening gig. 18 Sep 2013 Put up a setlist page for the 03 Jun 1987 Hüsker Dü gig at Karlsson, Stockholm, based on a newly surfaced audio recording. Thanks to Hannu Berghäll. 18 Sep 2013 Put up a poster image for the 24 Feb 2012 Bob Mould poster (Noise Pop/Bottom of the Hill, San Francisco), designed by Ed Luce. Thanks to Larry-Bob Roberts. 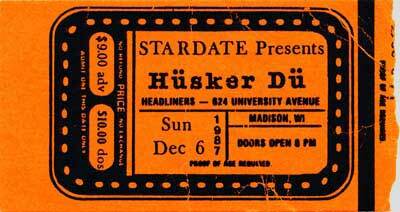 18 Sep 2013 Added a credit line to Michael Etoll for design of the 17 Sep 1982 Hüsker Dü flyer (Goofy's, Minneapolis). Thanks to Eva Mozey Etoll. 13 Sep 2013 Put up a poster image for the 15 Sep 2013 Grant Hart show at Galeria Olido in São Paulo and updated the 2013 poster index page. 11 Sep 2013 Recent Grant Hart date added: 09 Sep 2013, Danny's Tavern, Chicago. Also put up a venue image page for Danny's and a performance stills page. Updated the 1981 and 2013 poster index pages. Put up a poster image for the Bob Mould band dates and added it to the 2013 poster index page. 02 Sep 2013 Put up venue image pages for Vera (Groningen NL) and Rex Club (Paris). Thanks to Kieron Perry. Also fixed the broken Rex Club link on the dates page. Updated the 1986, 1992, and 1993 flyer index pages. Thanks to Stefano Vietti for the images. 01 Sep 2013 Put up a performance stills page for the 16 Jun 1987 Hüsker Dü show at BIG in Torino, Italy and added its link to the dates page. Thanks to Stefano Vietti. 01 Sep 2013 New Bob Mould Band date announced: 05 Sep 2013, Doug Fir Lounge, Portland OR (more info). Thanks to Jason Narducy (Iowa City), Ryan King (Lawrence), and Alan Hoss (Omaha). 25 Aug 2013 Grant Hart's Aug-Sep 2013 UK tour has been canceled: x-ed out those dates on the dates page. 15 Aug 2013 Put up a performance stills page for the Bob Mould Band gig at The Haunt, Ithaca NY, 02 Aug 2013. Thanks to Darren Prodger. 14 Aug 2013 Put up a venue image page for The Haunt in Ithaca NY. Thanks to Fred Martens. 07 Aug 2013 Put up a setlist page for the 03 Aug 2013 Bob Mould Band gig at Osheaga Festival in Montréal. Also updated the dates page to reflect the cancellation of the band's previously scheduled appearance at the Grove Festival in Niagara-on-the-Lake on the same date. Thanks to Jason Narducy. 07 Aug 2013 Upgraded the venue image page for Oar Folkjokeopus/Treehouse Records in Minneapolis. Thanks to Paula Warner for the Cake Shop pointer. 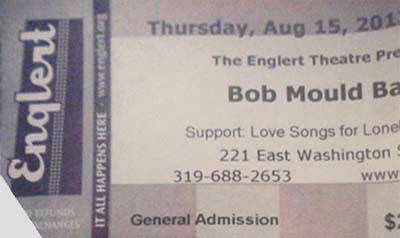 05 Aug 2013 Corrected some long-standing misinformation about the 04 Dec 1989 Bob Mould concert in Vienna that appeared in the annotated discography entry for the Bob Mould Live In Europe bootleg CD. Also fixed the broken dates page link to the venue site (U4) and a broken link to the CD artwork page. Thanks to Heinz Goedl for all the info. 05 Aug 2013 Added more info to the annotated discography entry for Bang Zoom #6 cassette magazine, featuring a Hüsker Dü interview after a gig at Maxwell's in Hoboken, plus a live performance of "Out On A Limb." Also embedded the YouTube video made from the Hüsker segment. Thanks to Guy Ewald, who conducted the interview and helped pin down the date. 05 Aug 2013 Corrected the setlist for the 31 Dec 1984 Hüsker Dü gig at Maxwell's in Hoboken, having established that the recording in circulation is an incomplete combination of two separate sets. Thanks to Guy Ewald for the clarification and for confirming the date and venue. 03 Aug 2013 Put up a setlist page for the 02 Aug 2013 Bob Mould Band gig at The Haunt, Ithaca NY. Thanks to Travis Vande Berg and Fred Martens. 03 Aug 2013 Put up a venue image page for Sarah Sands Hotel, Brunswick (Melbourne), Australia (replacing a dead link). 02 Aug 2013 Put up a setlist page for the 01 Aug 2013 Bob Mould Band gig at Beachland Ballroom in Cleveland. Thanks to Jason Narducy and Walter Melon. 02 Aug 2013 Determined that Nova Mob played the three-day (30 Jul - 01 Aug 1993) Infest music festival (near Calgary) on the Saturday, pinning the date to 31 July. Updated the entry on the dates page. Thanks to Chris Hesler for his keen memory. 01 Aug 2013 Put up a performance stills page for Hüsker Dü's gig at The Rat, Boston, 23 Mar 1984 (opening for REM). Updated the 1989, 2003, and 2013 flyer index pages. 01 Aug 2013 Upgraded the artwork page for the Nova Mob Nova Mob (US) CD. 31 Jul 2013 Put up a performance stills page for Hüsker Dü's first Maxwell's gig, 23 Jun 1984. Maxwell's closed down for good tonight, ending a run that began in 1978. Thanks to Dave Rick for use of his photos. 29 Jul 2013 Put up venue image page for the site of the former Galactica 2000 in Sacramento CA and upgraded the venue description page. 22 Jul 2013 Put up a setlist page for the 12 Jul 2013 Bob Mould Band gig at Forecastle Festival in Louisville KY. Thanks to Jason Narducy. 05 Jul 2013 Put up venue image page for Brixton Academy, London. 04 Jul 2013 Put up another poster image for the 12 Jul 2013 Bob Mould Band gig at Forecastle Festival in Louisville and updated the 2013 poster index page. 03 Jul 2013 Upcoming Grant Hart date added: 12 Jul 2013, Turf Club, St Paul. The Bob Mould Band's Forecastle Festival gig in Louisville is also on that date. 02 Jul 2013 Put up a flyer image for the 05 Oct 1984 Hüsker Dü gig at City Gardens (Trenton NJ) and updated the 1984 poster index page. 02 Jul 2013 Updated the venue description page and venue image page for Headliners, Madison WI. Thanks to Joe Kassel for the detailed history of the venue. 02 Jul 2013 Added a new picture to the venue image page for City Gardens in Trenton, screencapped from the video on this KickStarter page. 01 Jul 2013 Put up a setlist for the 18 Jun 2013 Grant Hart & the Burn/Burning show at The Monto Water Rats, London. Thanks to Chantal Latchford. 27 Jun 2013 Put up a flyer image for the 15 Jun 1987 Hüsker Dü gig at Ritz (Novellara, Italy) and updated the 1987 poster index page. Thanks to Stefano Vietti. 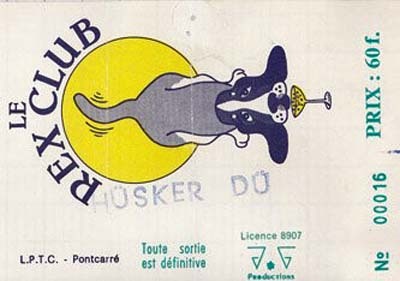 27 Jun 2013 Put up a flyer image for the 12 Oct 1982 Hüsker Dü gig at Goofy's Upper Deck In Minneapolis and updated the 1982 poster index page. Also added this gig, which was previously unlisted, to the dates page. Thanks to Tom Hazelmyer for posting the image on his Facebook timeline. Thanks to Marcus Kernaghan for the Grant set and Jason Narducy for the Bob sets. 17 Jun 2013 Put up a performance stills page for Grant Hart's solo gig yesterday afternoon at Pine Lodge in Myrtleville, Ireland. Thanks to Colm O'Herlihy. Thanks to Alan Holland and Colm O'Herlihy for the Grant photo, and to Brian Schumacher for the Bob photos. 13 Jun 2013 Put up a setlist for the 08 Jun 2013 Grant Hart & the Burn/Burning show at Spirit Store (Dundalk, Ireland). Also updated the dates page to reflect the cancellation of the 09 Jun 2013 Derry show due to poor advance ticket sales. Thanks to Marcus Kernaghan. 07 Jun 2013 Put up a flyer image for the 18 Jun 2013 Grant Hart gig at The Water Rats in London and updated the 2013 poster index page. 06 Jun 2013 Put up a setlist page and a performance stills page for the 31 May 2013 Grant Hart & the Burn/Burning show at Stout Fest, Beamish & Crawford site (Cork, Ireland). Thanks to Colm O'Herlihy for the setlist and Bríd O'Donovan for the photos. Also put up a performance stills page for Grant's instore gig at plugd Records earlier in the day. 05 Jun 2013 Put up a setlist for the 02 Jun 2013 Grant Hart & the Burn/Burning show at The Townhouse (Galway, Ireland). Thanks to Marcus Kernaghan. 05 Jun 2013 Put up venue image page for the former Barowiak (now Birger Jarl) in Uppsala, Sweden. 01 Jun 2013 Put up a performance stills page for the 24 Jan 1982 Hüsker Dü show at Exit in Chicago. Thanks to Anthony Illarde. 31 May 2013 Put up a performance stills page for the 21 Nov 1989 Grant Hart show (backed by the Cateran) at Powerhaus in London. 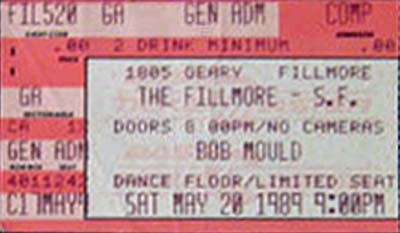 31 May 2013 Put up a performance stills page for the 06 Nov 1989 Bob Mould Workbook tour show at Palladium Dance Club (Salt Lake City). 31 May 2013 Put up another flyer image for the May-Jun 2013 Grant Hart & the Burn/Burning Ireland/UK tour and updated the 2013 poster index page. 31 May 2013 Put up a setlist for the 23 May 2013 Bob Mould Band show at Primavera Festival, Barcelona. Thanks to Garry Marshall. 30 May 2013 Added the just-announced 31 May 2013 Grant Hart & the Burn/Burning instore performance at plugd Records in Cork, Ireland to the dates page. 25 May 2013 Fixed the broken link to the Court Tavern in New Brunswick NJ and added a venue image page. 23 May 2013 Put up a flyer image for the 09 Jun 2013 Grant Hart & the Burn/Burning show at Sandino's in Derry, Northern Ireland, and updated the 2013 poster index page. 22 May 2013 Replaced the dead link to the former Atlanta venue The Point with a new venue description page and added a venue image page showing the building in its current incarnation as a Clothing Warehouse outlet. Thanks to James Barber. 22 May 2013 Put up a setlist for the 21 May 2013 Bob Mould Band show at Electric Ballroom, London. Thanks to Al Millington. 21 May 2013 Put up a performance stills page for last night's Bob Mould Band show at Academy 3 (Manchester UK). Thanks to Opu Anwar. Thanks to Scott Turner for the Manchester ticket scan. 21 May 2013 Put up a venue image page for Academy 3 in Manchester UK. Also put up a set times sheet for the gig. Thanks to Scott Turner for the photos. 21 May 2013 Put up a setlist for the 20 May 2013 Bob Mould Band show at Academy 3, Manchester UK. Thanks to Opu Anwar. 18 May 2013 Put up a setlist for the 18 May 2013 Bob Mould Band show at Òran Mór, Glasgow, Scotland. Thanks to John Matts and Garry Marshall. 18 May 2013 Put up a setlist for the 17 May 2013 Bob Mould Band show at Cockpit, Leeds UK. Thanks to Opu Anwar. 17 May 2013 Put up a performance stills page for tonight's Bob Mould Band show at Cockpit (Leeds UK). Thanks to Opu Anwar. 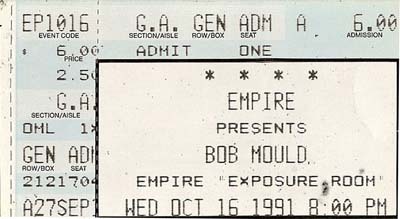 16 May 2013 Added a Bob Mould 16 Oct 1991 (Empire Club, Cleveland) ticket image to the ticket collage page. Thanks to Matt Lacefield. 16 May 2013 Added the just-announced 13 Sep 2013 Bob Mould Band show at Riotfest in Chicago to the dates page. Put up poster images for the RiotFest show and the 21 May 2013 show at Electric Ballroom in London, and updated the 2013 flyer index page. 14 May 2013 Fixed the dead link in the annotated discography entry for the Makes No Sense... video (14 May 1985, Camden Palace, London) to the YouTube video of the complete show. 10 May 2013 Added the just-announced 09 Jun 2013 Bob Mould solo electric show at the Summer Concert Series, Hartwood Acres Park Amphitheater, Allegheny County PA to the dates page. Put up poster images for the Hartwood Acres show and the 16 Jun 2013 show at Grandma's Sports Garden, Duluth MN, and updated the 2013 flyer index page. 10 May 2013 Updated the venue description page for the Twilite Room (Dallas) and added a venue image page showing the site of the now demolished building that was once home to the club. 08 May 2013 Updated the entry for The Argument (Grant Hart's forthcoming double album) in the annotated discography with the just-announced released date (22 Jul 2013) and a slightly revised track list. Also put up a placeholder artwork page. Info from today's Domino press release. 08 May 2013 Added the just-announced Aug 2013 Bob Mould Band show at Osheaga Festival Musique et Arts, Montreal to the dates page. Presumed date is 04 Aug, as it's the only day of the festival that doesn't conflict with Bob's other bookings, but there could be some schedule-shuffling going on. 06 May 2013 Added the just-announced 01 Aug 2013 Bob Mould Band show at Beachland Ballroom & Tavern, Cleveland to the dates page and put up a venue image page for Beachland Ballroom. 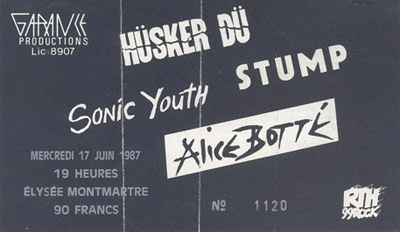 06 May 2013 Put up a performance stills page for the 17 Jun 1987 Hüsker Dü show at Élysée-Montmartre Theatre in Paris and added its link to the dates page. Thanks to Higgins-a-Gogo. 05 May 2013 Added a new section on guitar tabs and song lyrics. These pages were recovered from Tony Peart's defunct website and rehosted here more or less intact. I've made minor editing/formatting changes and added some introductory notes, but not altered the substance of Tony's considerable efforts. For additional details, please check out the link. 05 May 2013 Moved the embarrassingly obsolete Hüsker Dü resources page to the archives. At this point I think most people are aware of eBay. Few of the other listed "resources" have survived, and those were either well known or of limited usefulness. 04 May 2013 Put up a venue info page and a venue image page for Montana State University's West Gym (now known as Shroyer Gym) in Bozeman, where Hüsker Dü played on 04 May 1987. 03 May 2013 Added the just-announced Bob Mould Band Bumbershoot appearance, 01 Sep 2013 at Seattle Center, to the dates page. 03 May 2013 Updated the We Jam Econo entry in the annotated discography with an embed of the full movie on YouTube. Put up a generic tour dates poster image and updated the 2013 flyer index page. 29 Apr 2013 Another Bob Mould Band summer festival date announced: 17 Aug 2013, Maha Music Festival, Omaha NE. 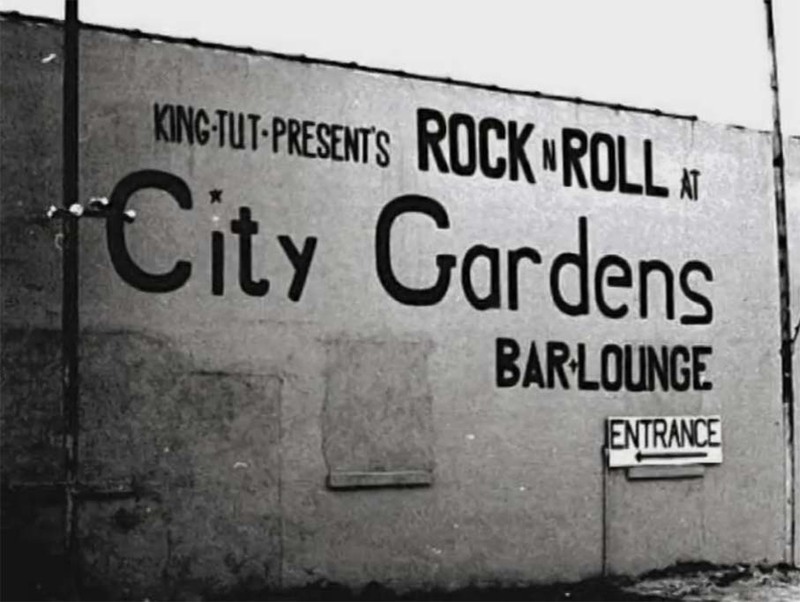 25 Apr 2013 Put up a venue image page for Benny's, the long-gone club in Richmond VA where Hüsker Dü played on 25 Apr 1983. Thanks to Rusty Moore. Also pinned down the Rex Club date to 27 Sep 1985. Thanks to Higgins-a-Gogo for the images and info. 23 Apr 2013 Upgraded the artwork page for the Bang Zoom No. 6 cassette magazine, featuring an interview and a live song by Hüsker Dü, and made some minor updates to its annotated discography entry. 23 Apr 2013 Put up a performance stills page for the 23 Apr 1987 Hüsker Dü show at UNLV Ballroom, Las Vegas NV, and added its link to the dates page. 21 Apr 2013 Put up a venue image page for Terminal West in Atlanta. 21 Apr 2013 Put up a poster image for the 17 Apr 2013 Bob Mould Band show at Terminal West, Atlanta and updated the 2013 poster index page. Thanks to Josh Greenbaum. 21 Apr 2013 Put up a performance stills page for the 17 Apr 2013 Bob Mould Band show at Terminal West in Atlanta and added its link to the dates page. Thanks to Josh Greenbaum and George Middlebrooks. 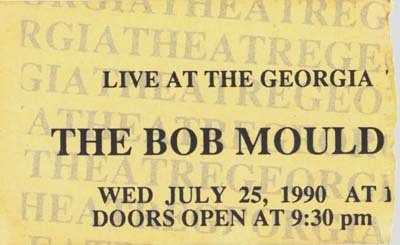 21 Apr 2013 Put up a performance stills page for the 27 Sep 1991 Bob Mould show at Barrel Organ, Birmingham UK and added its link to the dates page. Thanks to Rob Tromans. 21 Apr 2013 Put up a setlist for the 18 Apr 2013 Bob Mould Band show at Cat's Cradle, Carrboro NC. Thanks to Greg Phillips. 21 Apr 2013 Added an entry to the Commercial Releases section of the annotated discography for the Record Store Day Statues/Amusement 2x7". Also put up an artwork page for it and added its entry to the summary discography. 18 Apr 2013 One more Bob Mould summer festival date discovered: 15 Jun 2013, Rock the Garden, Minneapolis (outside the Walker Art Center). Put up an Englert Theatre poster image and updated the 2013 flyer index page. 09 Apr 2013 Upgraded the artwork page for the Bob Mould Egøverride CD EP, released 17 years ago today. 05 Apr 2013 Put up a setlist for the 30 Oct 2012 Bob Mould Band show at the El Rey Theatre in LA. Thanks to Dominique Valentin. 05 Apr 2013 Added a previously unlisted Grant Hart/Nova Mob gig to the dates page: 28 May 1992, 9:30 Club, DC. Thanks to Jason Stull. 04 Apr 2013 Put up a venue image page for Café de la Danse in Paris. 03 Apr 2013 Added an entry to the Live Video section of the annotated discography for this Hüsker Dü video that just surfaced from the 17 Dec 1984 show at the I-Beam in San Francisco. Thanks to Michael Milo Campo for the pointer. 31 Mar 2013 Added the Hüskers' second-ever show to the dates page: 31 Mar 1979, Ron's Randolph Inn, St Paul  same place as their first show, just the night before. Greg Norton says that the band played three sets, all covers, on each night, and that fourth member Charlie Pine (keyboards) was present for both shows and not dropped from the band until the third show, a few weeks later at Macalester. Thanks to Greg Norton. 29 Mar 2013 Added an entry to the TV Appearances section of the annotated discography for this Hüsker Dü feature that ran on Austrian TV in 1987. Thanks to RJ van der Woud and Memen Tomori von Altprotz. 29 Mar 2013 Made some upgrades to the venue image page for Duffy's in Minneapolis. 29 Mar 2013 New Bob Mould solo date announced: 16 Jun 2013, Grandma's Sports Garden, Duluth MN. 21 Mar 2013 Upgraded the artwork page for 2001 K-Tel Gimme Indie Rock V.1 double CD complation that features Hüsker Dü's "Pink Turns To Blue" as the leadoff track. 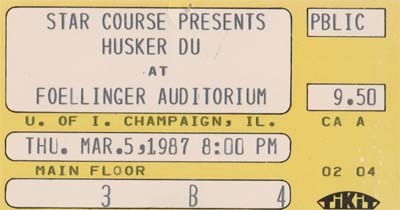 19 Mar 2013 Updated the performance stills page for the 19 Mar 1987 Hüsker Dü gig at UMass Amherst. Thanks to Ted Theodore and Artrocity. 18 Mar 2013 Added a third Daniel Corrigan publicity photo of Nova Mob from the Last Days Of Pompeii shoot to the publicity photo index page. 13 Mar 2013 Updated the venue description page for the long-defunct Odeon in Münster, Germany, and added a venue image page. Thanks to "Kirsty" from Münster. 13 Mar 2013 Put up a performance stills page for the 12 Mar 2013 Bob Mould Band show at Fowler's Live in Adelaide, South Australia and added its link to the dates page. Thanks to Ritchie Marshall and Garry Marshall. 09 Mar 2013 Put up a venue image page for the Newport Music Hall in Columbus OH, replacing the dead link on the dates page. 08 Mar 2013 Put up a flyer image for the 06 May 1986 Hüsker Dü show at the Backdoor (SDSU, San Diego) and Deventer NL and updated the 1986 poster index page. 08 Mar 2013 Put up a performance stills page for the 01 Mar 2013 Bob Mould Band show at the Horseshoe Tavern in Toronto and added its link to the dates page. Thanks to Steffen Paulus. 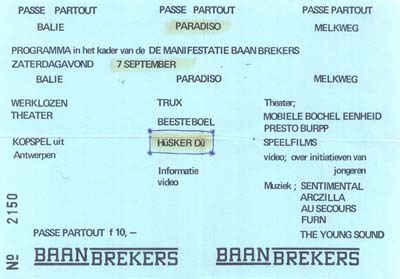 08 Mar 2013 Put up a poster image for the 08 Sep 1985 Hüsker Dü show at Burgerweshuis in Deventer NL and updated the 1985 poster index page. Thanks to Robert Jan van der Woud. Put up Forecastle Festival and Grove Festival poster images and updated the 2013 flyer index page. 03 Mar 2013 Put up a setlist page for the 02 Mar 2013 Bob Mould Band show at Magic Stick in Detroit. Thanks to Jason Narducy. 02 Mar 2013 Put up a setlist page for the 01 Mar 2013 Bob Mould Band show at Horseshoe Tavern in Toronto. Added "Screaming Fist" (covered during the encores, with Sam Sutherland on vocals) to the song titles list and the songs covered list. Thanks to Aaron Sumner and Jason Narducy. 02 Mar 2013 Put up an upgraded venue image page for Bowery Ballroom in NYC, replacing the old link on the dates page. Thanks respectively to Kirk Johnson, Pat James Longo, Tcpunk Facebook page, and Albert Mimo Warpechowski for the ticket images. 02 Mar 2013 Put up a performance stills page for the 27 Feb 2013 Bob Mould Band show at the Bowery Ballroom in NYC and added its link to the dates page. 01 Mar 2013 Put up setlist pages for the Bob Mould Band shows at Bowery Ballroom in NYC, 26 Feb 2013 and 27 Feb 2013. Thanks to Jason Narducy. Also put up a venue image page for Electric Ballroom, replacing an old, broken link. 24 Feb 2013 Belatedly added entries to the summary discography and the Commercial Videos section of the annotated discography for See A Little Light: A Celebration Of The Music And Legacy Of Bob Mould, pre-released in December to Kickstarter supporters. 24 Feb 2013 Put up a poster image for the 11 Aug 2012 Bob Mould Band show at the Paradiso in Amsterdam, added a photo of the printed setlist to the setlist page, and added a photo of Bob posing in front of the club with fan Sven Deusing to the candids page. Thanks to Sven Deusing for all the images. 19 Feb 2013 Uploaded the 19 Feb 1986 Hüsker Dü live video (Sherwood Country Club Indianapolis) to YouTube and embedded it in the annotated discography entry for the video. 17 Feb 2013 Added a previously overlooked second Sydney date on the upcoming Bob Mould Band Australia tour: 10 Mar 2013, Annandale Hotel. More info here. 17 Feb 2013 Uploaded the 1991 Night Flight feature on Minneapolis bands to YouTube and embedded it in the annotated discography entry for the program. Much of the promo video content had to be cut in order to get YouTube to accept the upload. 14 Feb 2013 Uploaded both the Nova Mob Admiral Of The Sea promo video and the longer MTV X-Ray feature from which it was taken to YouTube. Embedded the videos in the corresponding annotated discography entries for the Admiral video and the X-Ray video. These videos are blocked in some countries because they match third party content. 14 Feb 2013 The unconfirmed 20 Feb 2013 Grant Hart gig at the Record Bar in KC now looks like a no-go. Updated the dates page. 11 Feb 2013 Put up a venue image page for Slim's in San Francisco, replacing the dead link on the dates page. 10 Feb 2013 Previously unlisted Hüsker Dü show added to the dates page: 02 Dec 1984, Robot's Loft, Iowa City IA. Also put up a venue description page for the space, a warehouse loft owned by an artist named "Robot." Thanks to Kal Spelletich, who booked the gig, and Rob Sohlberg, who first mentioned it on Facebook. 09 Feb 2013 Added an upcoming Grant Hart show to the dates page: 20 Feb 2013, Record Bar, Kansas City. (Note: info via songkick; Record Bar calendar lists a different lineup.) Thanks to Paula Warner. 08 Feb 2013 Put up a page of candid shots of Hüsker Dü, taken by Mike Blur on 13 May 1984 in Lawrence KS, the day after the gig at the Lawrence Opera House. Updated the Hüsker Dü candid images index page. Thanks to Mike Blur, Jason Willis, and Mike Soden for helping to ID these photos. Added the Stache's show to the dates page, where it had not previously been listed. 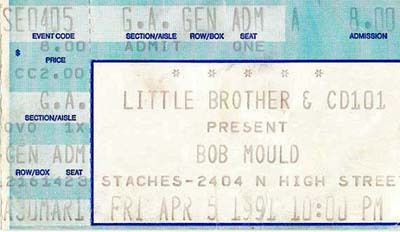 Thanks to Casey Lowry for the Bob Mould ticket images, and the Tcpunk Facebook page for the Hüsker ticket image. Thanks to Roger Morgan for the photos and Greg Sewell for confirming the date of the Crystal Pistol gig. 03 Feb 2013 Restored the Guitar Geek's diagram of Bob's Sugar-era rig link to the Hüsker Dü links page. Thanks to Tom Willecome. Put up a poster image for the two shows and updated the 1985 flyer index page. Thanks to Oktay Gürbüz. 29 Jan 2013 Added entries to the Promo Videos section of the annotated discography for the two recent Bob Mould videos, The Descent and Star Machine, and updated the Summary Discography. Greg Norton, Orpheum, Boston, 20 Mar 1987. Bob Mould, Pearl Street, Northampton MA, 21 Oct 1990. Grant Hart, Club Baby Head, Providence, 03 Jun 1992. 20 Jan 2013 Added the 23 May 2013 Bob Mould Band appearance at the Primavera Sound Festival in Barcelona to the dates page. Put up a poster image and updated the 2013 flyer index page. 20 Jan 2013 Put up a performance stills page for the 21 Mar 1987 Hüsker Dü show at the Agora in West Hartford CT and added its link to the dates page. Thanks to photographer Ted Theodore for allowing the use of the photos in his Flickr set..
18 Jan 2013 Added the overlooked Bob Mould Band performance for Austin City Limits (01 Nov 2012, Moody Theater, Austin) to the dates page. Also put up a venue image page for the Moody Theater, put up a poster image for the show, and updated the 2012 flyer index page. 18 Jan 2013 Fixed the dates page link to The Fez in NYC (defunct, but retaining a vestigial website), and added a venue image page for the club. 10 Jan 2013 Added a previously overlooked second Bob Mould Melbourne, Australia show (14 Mar 2013, Corner Hotel)) to the dates page. Thanks to Rüdiger Höckel for pointing out the omission. 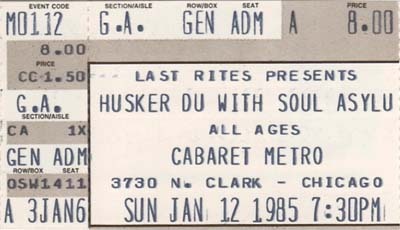 05 Jan 2013 Pruned some dead links from the Hüsker Dü links page and added a link to the MNPunk Hüsker page. 04 Jan 2013 Added Bob Mould's just-announced 26 Jan 2013 gig at Cobb's Comedy Club in SF to the dates page More info here. 02 Jan 2013 Put up the entire 1985 Minneapolis Musicians calendar (featuring Grant Hart as Mr. June), with an index page linking to large-format individual calendar pages.